What If You Lived In A Place Where Adventure Didn't Exist? What If You Lived In A Place Where Adventure Didn’t Exist? It is easy to make a living from adventure in the UK. The industry is established and growing. Work opportunities are replete. Job boards are filled with placements; gear and apparel retailers are multiplying; adventure tourism has rarely been more popular. And if the idea of employment doesn’t float your boat, you can simply become a self-employed adventurer by following these ten easy steps. The point is this: whatever you might choose to do in the adventure scene, it will be possible primarily because of the fact that there exists an adventure scene to be part of. Now, imagine – just for a second – that there is no ‘adventure scene’. That there are no outdoor stores or online retailers. That there are no hillwalking or mountain-biking or travel magazines on the shelves. That there are no walking trails or bike routes or watersports centres. That nobody is interested in hearing your talk or seeing your photos or buying your stupid book. That the idea of heading out of town to sleep on a hill is unheard of; that the only people who want to do such things are foreigners with weird ideas. Welcome to my life in Armenia. It is impossible to overstate how differently my daily life plays out in Yerevan, as compared to when I come to the UK. As I set foot on British soil, I feel pulled in by a kind of gravitational field surrounding the broad concept of adventure, which increasingly seems to spout from every billboard and poster and TV ad, as well as manifesting itself in a thriving subculture, and by virtue of my work and associations I seem to drift reluctantly towards its central region as some kind of ‘personality’ within that world. Back in Yerevan, I am some random Angliatsi who married an Armenian girl, speaks the language badly, and never has a satisfactory explanation for what his job is. End of. This is sometimes nice – I hate being the centre of attention anyway and prefer to choose my friends carefully – but since Tenny and I made the decision this year to move to Yerevan full time, I have found this general absence of interest in anything adventure-related to be frustrating. Partly it’s because of a change in how I perceive my role there. I felt in the past that Armenia was a place to live a relatively low-key existence while seeking adventures in other parts of the world; certainly not a place for the kind of adventure-related work I could do in the UK. And so the lack of an adventure ‘scene’ in Armenia didn’t really bother me that much. I could sit around writing books and blogs, being nicely anonymous, while getting my adventure kicks elsewhere. But this all changed last summer as I was trekking in the mountains of Armenia – a wild back-country hike through mountains, forests and plateaus at the height of summer. It was my sister-in-law Victoria who caused the upheaval. Originally from Haleb (Aleppo) and of Armenian descent, she had been living in Yerevan for a couple of years. She’d originally come to the Armenia with her family for a two-week holiday and then, by virtue of the road to Aleppo International Airport being suddenly blown up, had had her visit extended – indefinitely. Not to be downtrodden, she rented a flat, got a job, and became one of Yerevan’s most active Couchsurfers – which is how she’d met my brother. Gregarious and spontaneous, the first thing Victoria had done when I’d tracked her down this summer was to volunteer me to teach documentary filmmaking to schoolchildren at a summer camp in the village of Akhpradzor. The project was run by Nanor, another Syrian-Armenian who was now based in California and came every summer to manage volunteering projects in this tiny village, where Victoria had been helping manage this year’s effort. And so twenty or so of us laid out our Therm-a-rests in the empty classrooms of the old Soviet-built school, where we lived while running the classes (and building a new outhouse and playground for good measure). It wasn’t my usual kind of thing – not at all. Neither was it the kind of thing that any of the other volunteers did in their ‘real lives’. Yet there was something intensely powerful and fulfilling about the whole experience, the source of which mystified me. And to think I’d almost opted out because I had ‘better’ things to do in Armenia. After it was all over, Victoria (and her 3-legged dog Tatev) had decided to join me for the long-awaited hike – along with my wife, Tenny, who had first come to live in Armenia in 2003. The vistas we encountered were nothing short of staggering. And while walking through this wild landscape, we talked about the source of that intensity, which had been no flash in the pan because it had stayed with me and was now playing on my mind. It seemed there were a few discernible elements at work. Chief among them was the group effort, the shared experience – everyone working towards a common goal, personal differences taking a distant back seat. There were challenges aplenty, yet it had been fun to overcome them, because rather than being motivated by financial rewards, the reward was intrinsic. Everyone was there out of choice; no recompense other than the satisfaction of being part of a greater whole. The other obvious thing was that it was tangible, practical, hands-on, in-your-face, rowdy, utterly human – no digital abstractions, no screens (except in the IT classes), no emails or social media; heck, no electricity for half the days. To get water, one wandered across a cowpat-smeared track to where a bit of plastic pipe emerged from the dirt. Food? Get one of the villagers to dig up some potatoes or slaughter a sheep. Simple, makeshift, reactive, and immediate; punctuated by the realities of subsistence living, and surrounded on all sides by the bleak, dramatic beauty of the high Armenian plateau. We continued walking. My brother Ben, visiting from Canada, joined us for the second stint of the trek. The scenery turned from staggering to jaw-dropping. I’d been wanting to walk the length of Armenia for years. The idea had simmered; and now here I was. Through all my previous years living here, I’d always known that the wild backcountry of the Caucasus was jam-packed with potential for all manner of adventures; real exploration of a country whose regions remained uncharted since Soviet military cartographers during the Cold War era made the 1:50K topographic maps I’d recently got my hands on copies of. Why had I left it so long? Part of it was the perceived inaccessibility of it all. Those maps were almost impossible to come by. Military personnel still got in trouble today for making them available. Yet they remained the best topo maps available. If only someone would go out and make digital maps of some of these trails, I thought. There was another reason being part Nanor’s volunteering project had inspired me. She’d come here and created something from scratch. I realised that I too could just as easily decide to stop treating Yerevan as a retreat, and instead choose to dig where I stood. After all, I was going to be living here for the next several years. And if my unplanned volunteering experience provided any kind of insight, it was that working with others to achieve something tangible was where inspiration, lasting bonds, and ultimately meaning could be found – rather than continuing to play the blogger/filmmaker/author/anti-adventurer on an extended hiatus from where he belonged. But what could I create? And how? Looking for a job seemed futile, as my conundrum would be the same as in the UK: I was unemployable. And anyway, my strongest skills were operating outdoors, planning expeditions, building camps, reading maps and finding routes, and going on expeditions; together with the digital skills of managing websites and social media, and the creative stuff of writing, photography and filmmaking. What kind of project would combine these things, get other people involved, result in something tangible, beneficial to the world, and be meaningful and fun to those participating in it? And how on Earth would it be funded? This was the nut I’d been trying to crack for years. As I mentioned at the beginning of this article, Armenia has no outdoor or adventure scene. Sure, there’s a Facebook group of mountain bikers posting endless images of disc brakes and suspension forks, and an Alpine Federation whose dingy office in an even dingier part of town doubles up as the nation’s sole outdoor equipment retailer (though nobody knows the address and the website has been under construction for years). But this is not a scene or an industry. It’s a tiny handful of outcasts, doing their thing, ignored by society, with seemingly no interest in getting anyone else involved anyway. It was almost as if someone needed to do something – something big and newsworthy – to put adventure on the map in Armenia. For it is surely a place of immense untapped potential in this regard. Not to mention the fact that an increase in adventure tourism or so-called ecotourism, delicately managed, would be of real benefit to many of the country’s more impoverished outlying communities, as was already happening in neighbouring Georgia. Ben and Victoria decided to go hitch-hiking, leaving me to continue walking with a retired Frenchman named Theirry. Thierry was on a journey entirely for his own reasons. He had walked from France to Armenia, departing two and a half years previously, and wound up at Victoria’s house, as most Couchsurfers seemed to do on their way through the country. He was heading for Iran. His journey reminded me of my own, the one I’d made by bicycle many years ago, which had also brought me here – meandering, slow, unpredictable, and motivated by nothing more than selfish curiosity as to what might happen if I did it. That had been fine; indeed, I believe that a wholly selfish journey can be a key instructional exercise in a person’s development and growth, whether before or after a lifelong career. But for me to do more such journeys had felt increasingly self-indulgent. This was why my last two major expeditions had had a bigger purpose to them. Each had involved collaborating with many other people and creating something that would hopefully make for a tiny bit of change in the world. As a result, they had been that much more rewarding in the context of having learned most of what I ever would about myself by simply wandering alone through the world. Perhaps that was why I’d stalled so long on hiking the length of Armenia, I thought. Perhaps the idea of doing it alone in pursuit of the usual spread of trite and inward-looking goals was one borne of habit. Dreams age; people move on. Perhaps what I really need to do is find a way to help other people explore Armenia. Then the universe crystallised, and all was clear, as if delivered by some unseen messenger. And I knew exactly what I was supposed to be doing for the next few years. 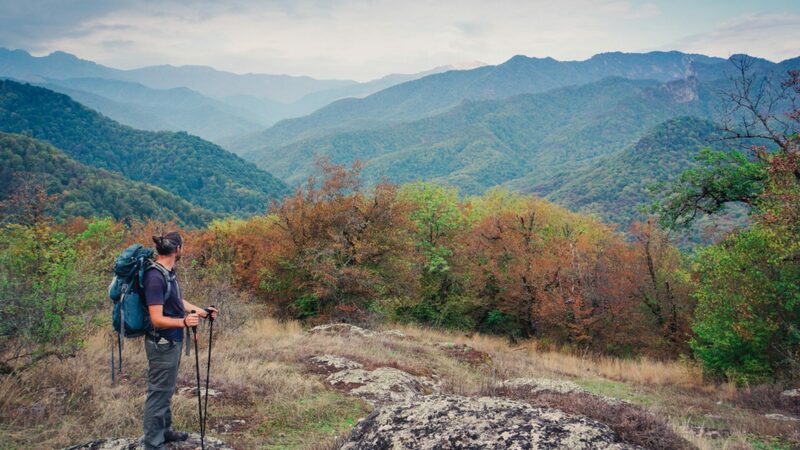 Building Armenia’s first long-distance hiking route. I haven’t been to Armania, nor am I much of a hiker, but just your writing about it makes me absolutely LOVE this. Fantastic idea, I wish you all the best with the execution. Great idea! Can’t wait to read more about it! I came across some information on a long distance hiking route in Armenia a while ago which I thought sounded great and would love to do one day. It’s called the Janapar Trail. Is this the one you mean? Good luck, in any event – it sounds like a great project. Hi Jennine – most of the Janapar Trail isn’t in Armenia but in Nagorno-Karabakh (only accessible from Armenia). Ah yes – thanks Tom! A good reminder not to trust all information I come across online! I am really looking forward to following this project and would also be interested in walking some sections. This sounds fantastic, Tom! I’ve wanted to visit Armenia for a long while & would definitely be up for going hiking so would love to stay in the loop with this! Fantastic, Flora, I’d love to have you over! Who else wants to come along and test out some routes? Sounds incredible – keep me posted ! Me! Sounds like a great idea! Would love to help map a trail or few. May have a window in late Feb – what’s the weather like then? Otherwise, June might be good. Great idea! There’s so much potential there. Are you familiar with Community Based Tourism (CBT) in Kyrgyzstan? They’ve done a fantastic job of setting up a network of offices that connect tourists with locals living in remote areas to provide accommodation and guides, with direct benefit going to those poorer rural communities. Sounds like that kind of model could be applied to Armenia as well. No, I hadn’t heard about this, so thank you for bringing it to my attention. It’s the kind of thing that could work really well. Armenia has been a country I’ve been intrigued and fascinated by since childhood (mostly because my favourite singer at the time had origin from that country). Though I have to admit I’ve never done anything much about this fascination other than briefly read up on Armenia and Armenians years ago and raise my head every time I hear a mention of this country (which allegedly isn’t very often). Hearing your tales about it and seeing your photos have definitely reignated my interest in this small country. So I’ll be following the development of your hiking route with interest (and hopefully come to hike it in the future too). I’m fascinated to hear who the singer was… not Mr Aznavour, perchance? Nope, it was Hélène Ségara. Wooohooo- flipping amazing idea Tom – Now why didn’t I think of that?? probably because I know absolutely nothing of Armenia except from your voice. The scenery looks astounding and yes to be there in the right weather must have been jaw dropping stuff. I wish you all the very best.. I know you will do this well as you come across as most dynamic, industrious and pretty full on in what ever you set out to achieve. Oh, I love the films by the way. I have watched 2 of them and saving.Karun to watch with my partner this weekend. Thankfully the region has a long and reliable summer! Happy you’re enjoying the films – season’s greetings to you too! Armenia is like noplace else I’ve been – incredible scenery and wonderfully warm and generous people. I look forward to going back someday, maybe to hike your trail! This looks very interesting, and the landscape looks very inviting. If it is an empty landscape, without infrastructure, how can you walk with such small packs and so few supplies? Where you on day walks? Might supplies be a problem for longer multi-day, or multi-week treks? Since the land seems so denuded of people, are there signs that larger wildlife is returning? Wolves? Bears? as with many other parts of Europe. That would make it a doubly attractive place to wander in. Good luck with the project. Saw bear droppings and hear wolves howling during this hike – plenty of wildlife here, which as you say is fantastic. As for supplies, we didn’t go more than 2 days without finding a village – believe it or not there are still people making a subsistence living here. Just ~2,000 people in the entire Kelbajar province according to the most recent survey. But there were multiple water sources every day. If you pack light in other departments you can easily carry days’ or weeks’ worth of food. Hi Tom, what a brilliant project! Did you not ride across the Pamirs during your original Ride Earth trip? If you did, then you must have heard of Murghab Eco-Tourism Association as one possible model. Let us know when you’re ready for hikers to test the route, but please do it sooner than later because our body clocks, though still ticking, have ticked their way past sixty. That’s a super cool idea and you are the right person to do it! Tom your style of writing makes every where sound heavenly, challenging and fun. Looking at the replies you have received I think you may have some volunteer adventure buddies coming to help you. And yes I’d love to help map a route in spring / summer time. Soooo so many wonderful places to walk, cycle, jump for joy, laugh and breathe huge lungfuls of happiness. Merry Christmas Tom and Tenny. Well Tom you inspired me to wild camp which I first tried cycling from Crete to England last year, not only that but not to carry a tent only a bivvy bag. A two month long ride with great memories. I would love to head in the direction of Armenia and help establish a hiking route. Please keep us posted with how we can help. The best of luck with the project.